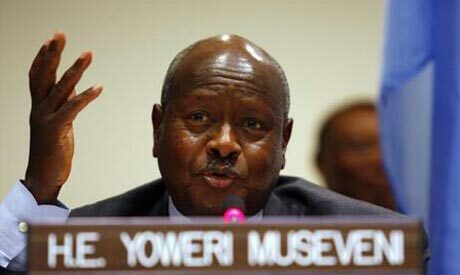 Ugandan President Yoweri Museveni has called on Egypt "to restrain its chauvinistic statements" on Ethiopia's Nile dam, Uganda's Daily Monitor reported on Friday. “The new government of Egypt should not repeat the mistakes of previous governments,” Museveni told a sitting of Parliament which was attended by diplomats. “The biggest threat to the Nile is not building hydropower dams, the biggest threat is the continued under development of countries in the tropics. “I have seen statements in the media coming out of the government of Egypt about the commendable work of Ethiopia. What Ethiopia is doing is what governments in Africa should do." Museveni added that Africans do not want to "hurt Egypt," but the latter cannot continue to "hurt black Africa." On Thursday, Ethiopia's parliament ratified a controversial treaty ensuring its access to Nile water resources. The deal replaces a colonial-era agreement that granted Egypt and Sudan the majority of water rights, and allows upstream countries to implement irrigation and hydropower projects without first seeking Egypt's approval. Egypt and Sudan have not signed the Cooperative Framework Agreement (CFA) led by the Nile Basin Initiative, but six upstream nations have. In addition to Ethiopia, Burundi, Kenya, Rwanda, Tanzania and Uganda have all signed, while Democratic Republic of Congo and newly independent South Sudan have said they also intend to join. For decades, Egypt held veto rights over all upstream projects, following powers granted by a 1929 colonial-era treaty with Britain. Egypt's subsequent 1959 deal with Sudan gave the two downstream countries more than 90 percent control of Nile waters. Ethiopia inked the deal in May 2010, and its ratification by parliament comes amid rising tensions between Addis Ababa and Cairo over Ethiopia's construction of the Grand Renaissance Dam on the Blue Nile. Egyptian President Mohamed Morsi has warned that "all options are open" over the construction of the dam, but Ethiopia insists it will not go to war with its neighbour, dismissing Morsi's words as "empty and violent rhetoric." Ethiopia began diverting the Blue Nile last month, paving the way for the construction of the $4.2 billion (3.2 billion euro) Grand Renaissance Dam, set to become Africa's biggest hydroelectric dam when completed. The Horn of Africa country has pledged to press ahead with the dam, despite Egypt's fury. Museveni is a wise modern african leader !! The Ugandan president, H.E. Yuweri Museveni, should be thanked for being bold enough to tell the truth. Yes, Projects like the Grand Ethiopian Renaissance Dam should be commended. He is just right in saying "Africans do not want to hurt Egypt, but the latter cannot continue to hurt black Africa." It is now time for the black Africans to do whatever is beneficial to their people. Thank you Mr President and May God bless you. No one benefits from war! Museveni's statement oozes racism and bitterness, as do the comments that have appeared on the pages of this publication, apparently written by Ethiopians. If Museveni and "Black Africa", as he puts it, continue to carry heavy chips on their shoulders, they should vent their anger in the right direction. Egypt has been an ally of African states and is a founding member of the African Union (OAU) and the Non Aligned Movement. Please stop sullying the discourse with racist and bitter statements and speak objectively. Yes the Nile is in fact shared by 10 countries and they all must act responsibly in light of the fact that the river flows South to North. The burden is on Ethiopia here to act responsibly. The fair observer has turned out to be the most unfair observer who unsuccessfully to cover what officials in Egypt openly threatened the most peaceful nation based on unlawful agreements signed only by their predecessors and colonizers. Since then Egypt officially became one who inherited the legacy of colonizers who did not have anything but contempt for countries black Africa. Learn your history and then talk. Where are those black Africans who ruled Egypt once upon a time? You are saying Egypt cannot be a source of African anger. Probably Britain which gave you the lopsided agreements imposed on countries like Ethiopia without their participation. You are upholding colonial era agreements that is why you are no different from colonialists who exploited and discriminated Africa. It is totally irresponsible to tell Ethiopia to stop the vital construction of hydroelectric dam on river Nile. You better direct your comment towards your leaders for common good. Colonialism is dead. Is it not? Why its treaties should be eternal. As an African I hate the phrase "colonial-era treaty". You see, this is what happens when all Egypt does is talk of war and blood. Egypt's government had a responsibility to protect the nation's interest based on modern legality (not fossilized ones, reason and cooperation. The sooner Egypt swallowed its pride, and showed up to the table to protect its interest the better for Egypt! God bless his excellency Yoweri Musoveni. We Africans all are proud of you as always. I hope Egyptian politicians and Islamic fundamentalists may wake up from their day-dream and take a note from your great advice to their own benfits. One thing is very clear by now for everbody: Egypt cannot beat Ethiopia legally, diplomatically and millitarily. The reason is simple: Ethiopia is following the genuine path while Egypt is following the greedy and the evil path. ...Ethiopia's parliament ratified acontroversial treaty ensuring its access to Nile water resources.The deal replaces a colonial-era agreement that granted Egypt and Sudan the majority of water rights, and allows upstream countries to implement irrigation and hydropower projects without first seeking Egypt's approval.'' What does it mean Ethiopia replace the colonial Nile deal? Was Ethiopia a party to that deal? Ethiopia had never been the party to the colonial Nile deal.The colonial Nile treaties of 1920s and 1950s only agreed by colonial Sudan and Egypt. Thus, ratification of the Nile deal in Ethiopia this week is by far the first treaty in history! PLEASE, UNDERSTAND ALL SITUATIONS BEFORE TRYING TO FORM STORY HERE!